If you think that a modern kit-built vehicle is beyond you, have a look at these CCW kits spotted in the HMRS display. 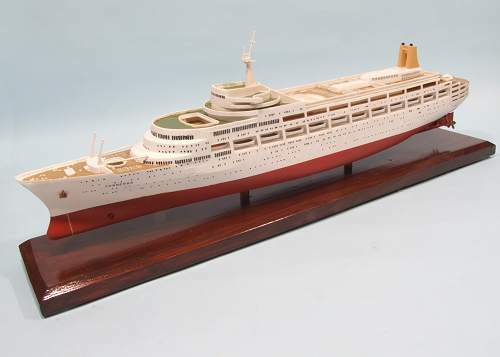 Dating from the 1950's this was an era when modellers were modellers. None of this taking the bits out of the box and sticking them together. First you had to shape the parts to form a tumble home. Even then you were glad that the windows had been cut out on a fly press for you. Once sanded, assembly was using boiled horse glue or something involving dead fish. You didn't care because first of all you'd sanding-sealed the wood to stop the grain showing through. Using sanding sealer (dope containing talcum powder) seals the wood and raises the grain. You then sand this back, being careful not to ruin the shape so carefully worked out earlier. Do this is a room without ventilation and you'll be very happy for a while and have a splitting headache the next morning ! A surprise find at Midland Railex a few days ago were some ex-Butlins railway engines. Not the big ones that everyone knows about, but 21 inch gauge models of Princess class locos that ran around various of Billy's camps. Two engines, built by Hudswell Clarke & Co. Ltd in 1938 were used to transport and entertain inmates in the holidays camps. 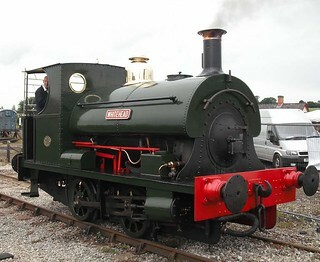 Rather than expensive to operate steam , they are powered by diesel hydraulic engines. I suspect this would have been cheaper to purchase and certainly more suitable for operation by paid staff. Volunteers might enjoy getting up at the crack of dawn, covering themselves in dirt and working a long hard day but in real life you just want to come in, start the thing up and get on with the job. The public wouldn't have been that bothered anyway - if they wished to ride behind the chuffer then the real railways were full of the things. Actually, it makes me wonder a little why people enjoyed the miniature train ride. At this time when you wanted to travel a long distance you had little choice but to use the train. Very few people had cars and those that did would spend much time tinkering an fixing them en-route. Without motorways, the journey by road wouldn't be as swift (everyone who's ever sat on the M6 or M25 is now laughing) as it is today. Whatever the reason, the little engines were well worked but eventually sold out of use 40 years ago. Eventually they ended up at the Midland Railway Centre alongside the real Princess Elizabeth. Holiday camp railways and miniature lines in particular are an under modelled subject. Probably the best known (to me anyway) example is Shifting Sands by Colin Peake. It's not as easy as you might think to do this. Real miniature locos aren't exactly the same as their full-sized brethren. Liberties have often been taken with the proportions and frequently you find that it's a completely freelance design. At the very least, tenders will be designed to accommodate a driver rather than coal. Thus, taking an N gauge loco and sitting a 7mm scale driver on top won't cut the mustard. You'll need to get hacking and wield the plasticard. A proper reference book this one. With my interest in slightly odd-ball railways, it was inevitable that I'd pick it up. Flicking through, the first thing that grabbed me were the huge number of plans. Proper, clear plans for the many Motor Rail product. Plans that cry out to be used to produce a scale model. In addition, the book is profusely illustrated with well reproduced black & white photos. 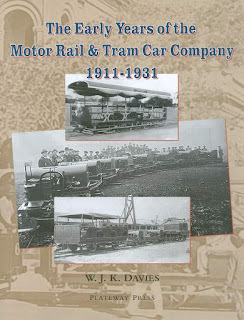 If you are a model maker then these are a book and since many of the locomotives are double ended, you could probably just work from this one book without filling your shelves with anything else. The history is comprehensive but to be honest, I found the text a bit on the dry side. I really can't argue with the quality though. My feeling is that Mr Davies really knows his stuff. It reads like a labour of love. As well as the details of many machines, the backbone of the text is a history of the company itself, or perhaps I should say companies since the lineage is pretty tortuous. MR&TCC certainly produced a huge variety of machines. 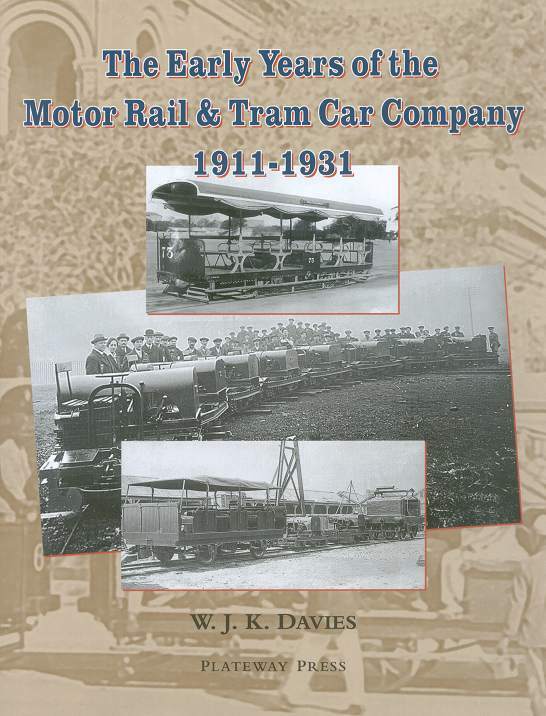 The most famous were armoured narrow gauge locos that served during the first world war and then returned to provide cheap motive power for may UK lines. Abroad though, the weirdness really starts. 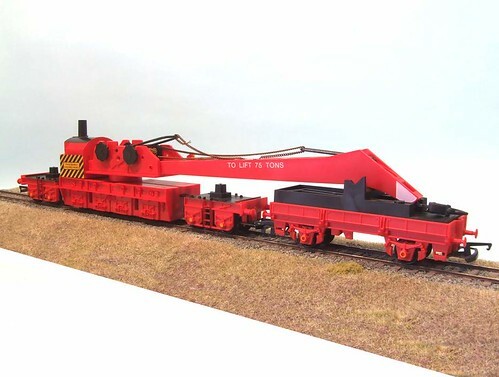 A motorised hopper wagon seems to be the weirdest but it's a close call. For standard gauge fans, a few shunters were produced but they were pug-ugly and rarely available in kits form. If you can get one (Impetus used to make suitable models in 4 & 7mm scales) then they were intended for a type of line rarely found in the UK - internal shunting within a factory complex or similar. One of the bonuses is that you get a lot of useful industrial scenes in the background. Many were posed but that's not a bad thing, for the photographer the plan was to show all the equipment clearly. With control issues sorted, it was down to the lake with the Pilot Boat. After a quick check that everything was working, I placed the model on the water and it didn't sink. That is always a good start. Gently easing the left stick forward, she moved off toward the middle. Waggling the right stick showed steering worked although I needed a lot of trim to get anything like a straight line. At this point a sensible modeller would carefully increase speed while performing gentle manoeuvres to ensure all is well. They wouldn't just shove the speed up to full. It went well though. The nose sticks in the air, sorry, she gets up on the plane quickly. If I'm being picky, perhaps the nose is a little too high but dropping the speed back a notch on the control (unsprung stick on a Planet 2.4 controller) sorts this out and provides a nice looking scale speed. The water washes up the sides well enough - possibly more spray rails might help although nothings going inside even with the unglazed windows. Duration on 1 pack appears to be about 20 minutes. Enough for a play. I might be able to improve this by tweaking the motor position a bit as despite all my best efforts the driveline doesn't sound as well lined up as I'd like. The noise isn't unrealistic though, a bit like the Class 22 on my model railway layout Flockburgh which growls alarmingly and fools some people into thinking a noise chip is fitted. Steering also needs a look. The rudder position is perfect so I think the requirement for loads of trim is due to torque steering caused by a powerful single prop drive. I would have investigated more but none of the Allen keys in model boat toolbox didn't fit the adjuster. Anyway, the boat sails, stays dry inside and remains on the topside of the water. Looks good too. When I last blogged the Pilot boat, I mentioned some issues with the speed control - an Mtroniks unit of a type I used many times. This one wasn't playing properly. Forward control was fine. Reverse on the other hand - well the red light indicating a radio signal lit up but the motor stayed still. After a lot of playing around I discovered that if I pushed the programing button while the light was on, a burst of backward thrust was achieved. Anyway, the next day I called Mtroniks and was quickly talking to a technician. He asked a few questions and decided it sounded like I had an old software version in the control. Upgrades require the unit to be sent in to the makers so that is what I was asked to do. Apparently as long as you haven't wired it back to front then even replaced plugs and modified leads don't invalidate the guarantee. That's very handy for this sort of device where you are very likely to have to change plugs (I did) before using it in a model. 2 days later, in the post, a brand new speed control arrived. No questions or quibbles. That's what I call service and one of the reasons I always use Mtroniks speed controls in my boats. Yesterday's post ended with a cutaway illustration showing a railway breakdown crane. 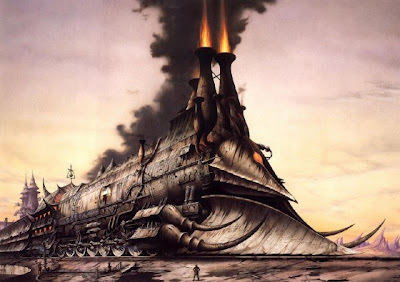 It was found on the Illustration Art Gallery website which also features the above image of the original Advanced Passenger Train design by Leslie Ashwell Wood. I've spent far too long already today digging through this site. If finances allowed, there would be a few technical pictures winging thier way to Parker Mansions to build a collection that would be a lot more interesting to look at than a lot of stuff in art galleries. What a lovely word - "operating". You don't see it much on modern model railway products but put simply, it means you can play with them. 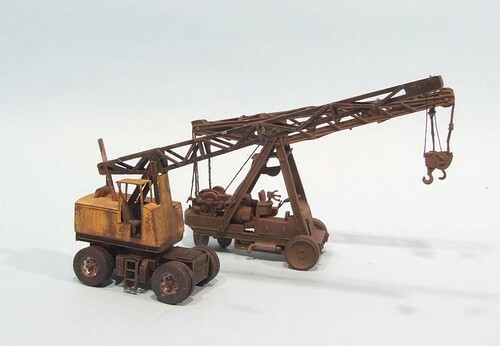 The breakdown crane set has been in the Hornby catalogue since 1971 and is preceded by a metal version from Hornby Dublo. 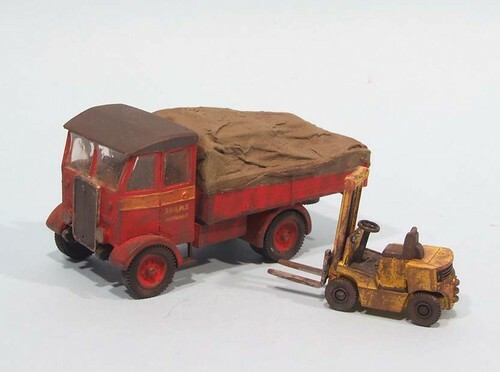 The set includes a crane, two riding trucks and a match truck. The jib can be raised by turning one of the knobs on the side, slews by swinging it by hand and finally another knob lifts the hook. You might think it's all a bit toy like but the model is surprisingly realistic. The most obvious error is that on the real thing, the chimney hinges backward to clear tunnels and bridges. The model version is fixed in place. The other change is more subtle and clever - on the prototype, cables handle the lifting. The model employs chains for the same task. Anyone who has even built a model crane will understand why. Model cables don't behave like real ones. They are always too stiff. Even with a big, heavy, cast hook, you find it difficult to keep any tension. Chains on the the other hand flex properly and hang nicely. Those RTR wallahs are cleverer than many railway modellers give them credit for. Fortunatly for real railwayman, these cranes were operated by steam rather than giant, knurled knobs, as shown in this lovely diagram from the days when childrens publications bothered to try and explain technical stuff. Considering I had no real information to go on, I didn't think I did too bad a job. There's a good chance that I was modelling an earlier version than the prototype shown. That would explain the rather more basic cab I built. More importantly, I think my version looks better. Not the sort of thing you are supposed to say as a model maker, but then I like to think I'm as much artist as engineer. Well, that's my excuse anyway. If that doesn't convince you, I think my model looks better than the real one and certainly better than the current Corgi die-cast. I'm really not sure about those close-fitting mudguards but I suppose with a decent dose of weathering it wouldn't look bad. If you want know more about my crane, this post on the blog explains. 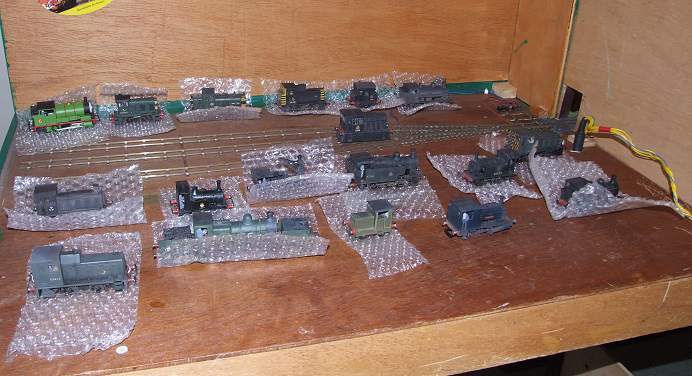 Anonymous writes a few days ago in the post on getting read for Midland Railex: Phil, it looks like you store your locos in bubblewrap? It's true, that's what the photo of stock looked like and it's not far from the truth. My stock boxes are wooden with plywood dividers. They were specially made for by a friend who mass-produced them for several club members many years ago. While probably the best boxes ever, those wooden sides won't do much for the engines paintwork so I wrap each one in a slip of bubblewrap. 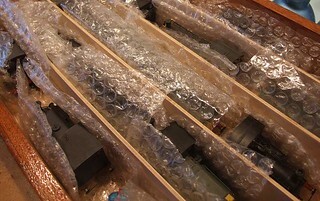 It doesn't seem to damage the models and stops them sliding around in transit. Packing the box is a heck of a lot quicker than trying to put individual models into their own boxes too. Tucked away at the back of this months Railway Modeller magazine is a little picture of my 01 Diesel along with a rather more impressive LNWR Teutonic. This isn't tied to a massive article, just a mention of the Double O Gauge Association modelling competition results. I sent a CD of the photos over to the editor after the event and he's managed to squeeze a couple in. 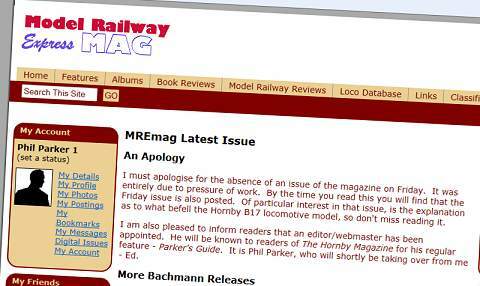 Those who are readers of MRE Mag, will have noticed a little announcement in yesterdays edition. Pat Hammond is retiring as editor of this long-established on-line publication and his replacement is - Me. Hopefully I will be able to continue Pat's good work whilst gradually evolving it with my own particular skills. Don't expect any big changes, just a few tweaks, after all, if it ain't broke, don't fix it. With over 15 years webmaster experience on my CV, I'll be approaching this as a web job rather than a specific model railway one and with a bit of luck this will stop me from descending into toy train hell with no interest outside the hobby. That's not healthy either for me or anyone I'm working with ! 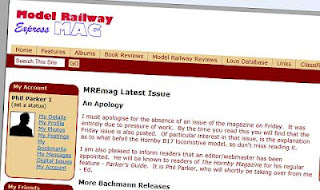 Obviously this isn't a full-time job so you'll still see me writing for Hornby Magazine as well as other publications and even keep updating this blog. My tenure as editor will begin on 1st September. In the meantime, please set www.mremag.com as a bookmark in your browser and prepare to visit on a regular basis. You don't get many toy chuffer shows in the summer. Apparently, when the sun it out, we are supposed to spend our time running around half-naked slowly turning lobster coloured. This idea overlooks the fact that most of us should not be unclothed in public and British people aren't adapted to the sunshine. Help was at hand last weekend with the Midland Railex exhibition taking place at the Midland Railway centre. As well as real engines, some pretty good model railways would be present along with a decent selection of trade and all the magazines that matter for the hobby. Quite a draw. We arrived on Friday and were directed to the HMRS building. Behind this is an old wagon works and our spot was to be behind a crane tank along with three other layouts, one of which was nearly ready as we moved in. Setting up was fine, even though we hadn't show Melbridge Dock for over a year. Fine until we put the legs up back to front, something not spotted until attaching the information panels, the last job. Hastily dismantling the model again sorted this but with red faces and not just from the heat. That heat turned out to be the only downside of the entire weekend. The crowds were friendly and talkative most of the time. Only one smelly bod turned up and after his question was answered, he interrupted a conversation but I decided to help as quickly as I could anyway for the good of out noses, vanished just as quickly. I think we had one of the cooler halls too with its high roof and open doors at the far end. Apart from one desoldered switch rail (quickly fixed) the layout ran pretty well. Our main problems seemed to be with too-free running wagons on the uncoupling magnets but that was possibly operators out of practise as much as anything. Saturday night allowed us to enjoy a quick ride up and down the line behind a Class 47 followed by cool drinks in the pub with the lads from Hull. All in all, a good show and we'll hopefully do it again. Crowds were apparently 50% up on the Saturday and good on Sunday too. Both days saw them running out of car parking. Thanks to the spread out nature of the site, I'm pretty certain not everyone found us but that will teach them to read the programme on the day - it was all clearly marked. Other highlight of the show - Sunday morning, outside the shed, watching Standard 5 and Peckett engines being prepared. There's not much to beat the smell and sound of steam engine at the start of the day after a full English breakfast. Thanks if you came by to say hello. It's always nice to put faces to blog reader statistics. Please do Get In Touch if you have questions I promised to answer. There's some photos on Flicr for your amusement. I want a kit for this engine and I want it NOW !! Seriously though, what a cracking image. Sadly, I can't find our where it came from originally but I did find a story that uses it for illustration. You can read it here. If you are just wondering, "What the hell is STEAMPUNK ?" then you can find your answer here. Finally, after a quite a battle, SS Canberra has sailed off to her new owner. You can read of my troubles with this aged Airfix kit elsewhere on this blog but the end result isn't bad. Mounting the model on a plinth certainly makes it look more impressive than just an assembled plastic model. It also made packing her up for postage a lot easier. I can't see why the same trick wouldn't work for any other boat either. All you need is a bit of wood and some brass bits. Presentation is everything it appears. At the same time as I was fighting the model, it's prototype caught up with me. Not the entire ship of course, that's long since been scrapped unfortunately, but a fitting. 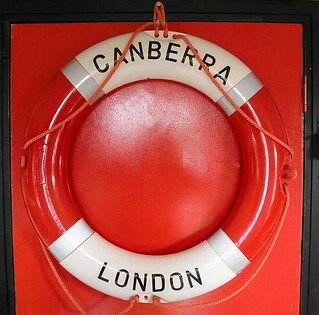 On the back door of our model boat club is hanging a genuine Canberra lifebelt. Donated by one of the members, it was a real surprise to see it hanging there and a little bit spooky. Has anyone else been haunted by the full-size version of something they are building as a model ? Yesterday, I promised to fill you in on the repair work required to make Melbridge Dock ready for a show this weekend. Bear in mind that the layout was first shown in 1988 and hasn't been out for a year or so. Job 1: No power to the controller. After a little work with the light up tester thing, I established that the 16V AC was lost in the lead from the transformer to the panel that the controller plugs in to. 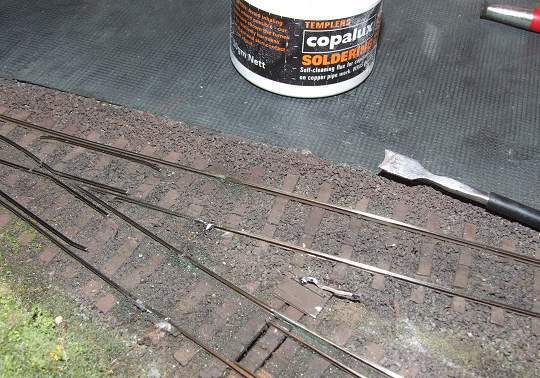 Examination of the said lead showed a lose wire in the connection between the Guagemaster wire and very old BT wire. 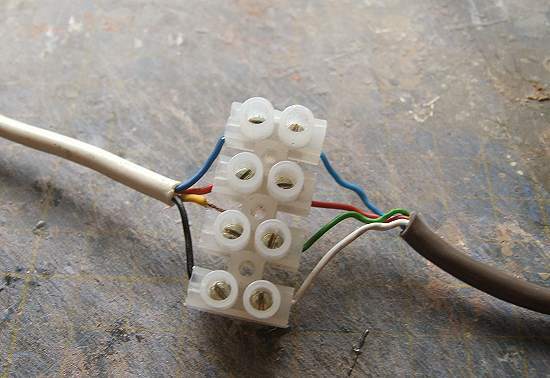 Since we use this transformer for all the layouts, it was time (after 5 years or so) to solder the wires together, bracing the joints with heat shrink tubing. Job 2: Dry joins in the trackwork. Loco testing showed that a couple of joins in the rails had gone "dry". I don't bother with jumper wires or fishplate between sections of rail so this will happen occasionally. Fixing the problem involved cleaning the join, slapping on a bit of flux and heating it up again. All being well, the longest part of this job is waiting for the soldering iron to warm up. Job 3: Test the locomotives. Each loco is taken from the box and run around the main loop that is the backbone of the track plan. Some models will also explore the sidings. This moves any lubrication around the bearings and gears as well as testing the point motors. To be honest, I don't need to do this as many of the engines will get a buzz while having their wheels cleaned, but it's my train set and if I want to play with it, I will. A quick count shows the stock box contains 26 locomotives. Only around half of these will go to the exhibition as we don't need them all and if I take too many, the display case looks over-full. I have a few favourites and a couple of stars. These rest is random. All I need to do now is pack the toolbox and load the car. Today we will be digging out Melbridge Dock in preparation for a trip to Derbyshire to take part in Midland Railex this weekend. In theory, this means we'll set the layout up in the living room for a couple of hours to make sure it works, then pack everything away ready to chuck in the back of the car on Friday. Since the layout hasn't been out for a long while, I'm expecting a bit of dry-joint repair and some dusting. Hopefully this is as bad as it will get - generally this layout has been pretty reliable since we built it back in the 1980's. One thing I can be confident of is that it will have advanced further than the photo above. We had only laid out the baseboards on the lawn to have a look at them together when our cat at the time, Tiger, decided that we really ought o be paying attention to him rather than these bits of wood. Anyway, please amuse yourselves on the Midland Railex website. I'll let you know tomorrow how things went. I'm not a fan of the Great Western Railway. Back in the early days of my railway modelling, the scene was infested with GW branch line termini. No exhibition was complete without at least five of the things. The fans always seemed so superior too. I could never understand it. 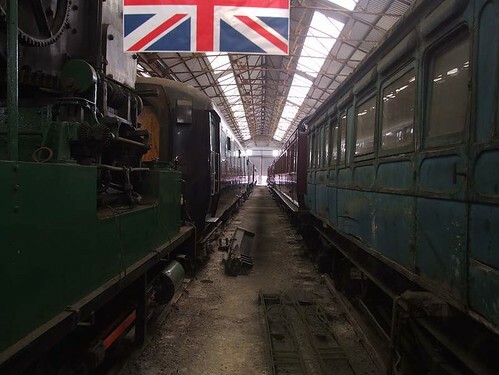 When Steam Railway repainted one side of City of Truro in BR black and caused furore amongst them, I wasn't the only person who laughed at the pinprick to their pomposity. Andrew Roden is a paid-up, Brunswick green painted member of the Great Western fan club. Fortunately, what could have been a dreadful hagiography is in fact a well balanced and very readable book. Starting from the foundation in 1833, he charts its growth and tells the story of the personalities behind it. Some names will be familiar, others less so. We've all heard of Brunel but I was surprised how early he disappeared from the tale and how many great men followed him. Indeed, most of the text is the post-Brunel story. This isn't a book on trains. The GW was much more than the sum of its engines. The network growth, (have a map handy for this bit if you don't know the south west of England) origins and eventual demise of Swindon works along with the town that grew up around it, efforts in two world wars and the last days before nationalisation. Even the arrival of BR doesn't mark the end of the story. Both successes and failures are examined. In fact coverage of the broad gauge network was very detailed and interesting as it explains the difficult position the company found itself in and the steps it took to extricate itself from this. Thankfully for the casual reader, this is not a technical book, hard-core nuts and bolt information has been left to other writers, but by the end even I'd worked out what all the fuss was about and why so many enthusiasts love it. Maybe I'm not the cleverest boat modeller in the world. I don't understand propellers or motors. Making a slow boat go slowly (or scale speed as we like to call it) is easy enough, but Pilot Boats aren't slow boats - they need to nip along at a fair old pace. Luckily, I have a boat that does just that - my Club 500 racer. This hull is slightly longer but less broad in the beam. On the Speedline stand, the demo model uses a 540 motor, just like the 500. 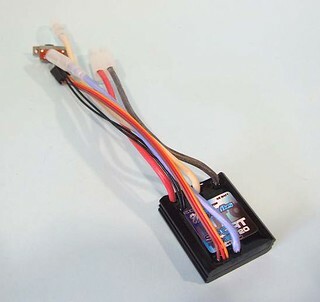 So, all I had to do was stuff a battery from the 500 inside, wire it all up and volia ! Working boat ! 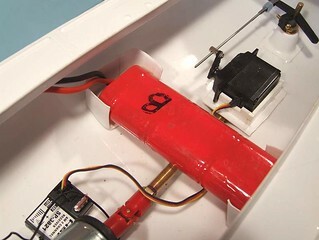 It's not quite that easy of course, the instructions show a pair of battery packs ether side of the motor but by mounting my single pack across the hull, the results should be very similar. Chopping up the mouldings supplied makes for a couple of retainers each side of the propshaft. So I wired it all up and switched it on. Whereupon the speed control decided it didn't want to work. More on this later. In my marine modelling career, there are several types of vessel I've always fancied building. Lifeboats form the bulk of the list but related to these is a Pilot Boat. Regular readers will know that I've been this way before with a terrible vac-formed kit. This time I have located a much better kit to have a go at from Speedline Models. The model is a re-issue of the famous HFM models kit with a few subtle updates. 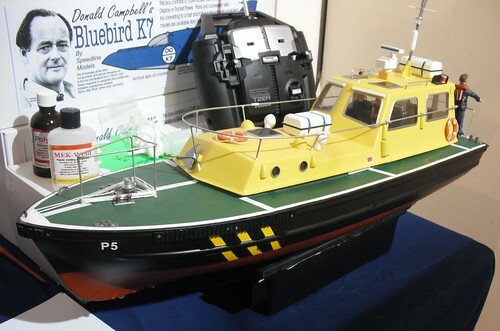 I spotted the kit on the stand at the International Model Boats Show last year and ordered one on the spot. A few delays in manufacture delayed delivery from a few months but when the kit arrived, it looked good. Needless to say, a few delays in me finding time to build the thing mean it's only just reached the workbench. A quick mention appeared in Model Boats Magazine back in May along with the promise that a fuller build would appear in due course. 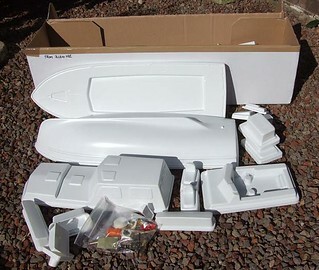 The kit is made up of vac-formed white styrene parts along with a bag of fittings. The builder has to supply a 540 motor and all the electronic bits (receiver, speed control, servo, battery) to complete the model. First job is to join the deck and hull together. The former is trimmed in line with the diagram shown in the instructions. This clips into a ridge in the hull and is fixed with plastic cement and a wash of Mek-Pak. Being able to glue with normal plastic solvents is a real bonus. Trying Robbie Dollie kit last year, I found that could only be assembled with superglue despite appearances, not nearly as satisfying to my mind, solvents fuse parts whereas superglue only joins them. 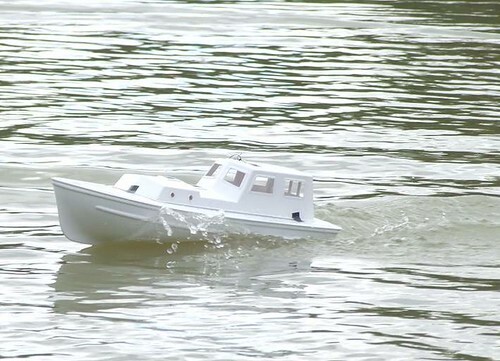 Not such a problem with model railways, but on the water, when you may pile the model into a buoy - less clever. Anyway, once the glue is dry, the excess hull is trimmed to the deck line and smoothed to appear as a single piece, which of course it is. Our capital city is surprisingly short of model shops. Once, there used to be one of every corner full of cockneys purchasing the latest Triang for a handful of the buttons from their pearly King or Queen outfit. One by one though, they all closed down and now the city is a barren wasteland for people who like making stuff in miniature. If you look around though, there are little oasis's. 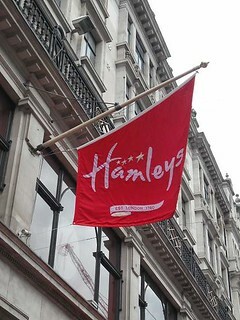 Hamleys are the largest toy shop in town and when I walked by a few days ago, one of the windows featured a display entreating us to visit the Hornby shop on the fourth floor. I did and was impressed. If you want Hornby products, you are in luck. 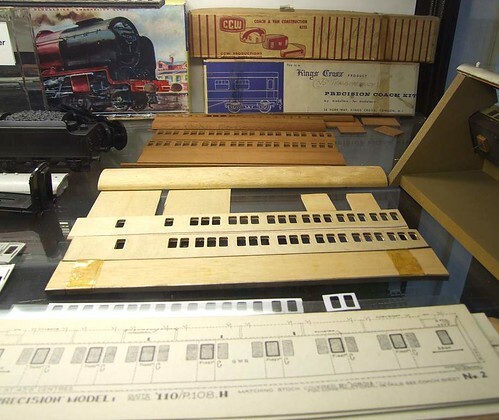 Not just trains either - a huge range of plastic kits from all manufacturers. Paint and glue may be obtained and a few tools. Not many though. Basically, if you need a tin of Humbrol or a present for a young relative, then you're in luck. Truth is, I was much more impressed with the Lego display on the next floor. Oddly, you can't get an escalator to this but the keen shopper ascends the staircase, who is looking down on you ? HRH Wills and Kate plus Harry and even Prince Charles. Full size and made from Lego. Brilliant. 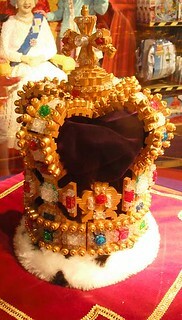 Elsewhere, I found a Lego crown and full scale Queen. Lots of giant minifigures made from - Lego. So, worth a visit for more than just the model making stuff. Assembling a set of steps from Swedish kit maker Ikea a few days ago, I was surprised to find the first picture on the instructions involved the Allen Key (more correctly called a Hex Head key apparently). This now comes with a hard plastic sleeve that the metal part is fitted in to. The result is easier to handle and the extra length provides a bit more purchase when trying to screw things firmly home in the woodwork. The "key" clicks in to place nicely. 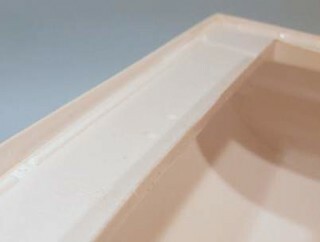 The handle is designed for two different sizes. I'll toss this into the toolbox for future use. 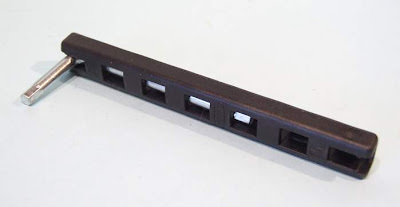 It ought to hold normal Allen keys too, not just the cheapo alloy versions that are found in the box with the bits. That's not a complaint, there's not need to supply a tool that will last longer than the job it's intended for. Only people like me would appreciate the improvement and we've got a set or two of the read keys anyway. Incidentally, am I the only person who visits a flat-pack furniture shop with gleeful anticipation ? I love putting this stuff together, especially when it's as well designed as the Swedes manage. Normally I'm on top of my deadlines for magazine work but last month things were running late. Worse, the Parker's Guide I'd intended to submit went a bit horribly wrong after about half a days work. 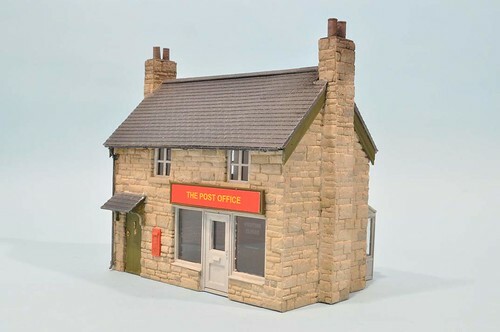 Diving in to the local model shop for an alternative, I picked up the Wills Craftsman kit for a stone Post Office. This wasn't entirely an impulse buy - we'd been considering one of these for the series for some time. Now it was time to get around to it. What you get in the box isn't so much a kit as a pile of material and some plans. Building it was more involved and even more fun than I anticipated making for a nice piece for the magazine. Elsewhere I've been reviewing things. Lots of odd-ball tools for a start. You don't get reviews of this sort of thing in other magazines because we go out and find things rather than waiting for them to plop through the letterbox all the time. You'll also find a few book reviews and my staff project of the EJAY lamp hut. Plenty of variety as usual. 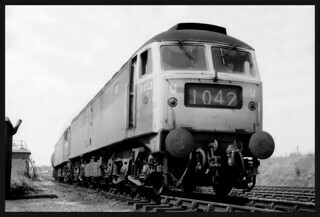 Can you enlighten me as to the purpose of the large number board over the end windows that this class of car as well as similar number boards that so many other MU's and diesels have. Photos always seem to show a combination of Number-Letter-Number-Number but I cannot find a site that explains what these mean. 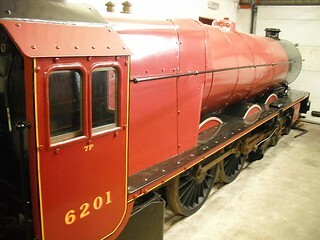 A photo of a DMU117 in a museum setting shows it with "2K31". The answer is that those headcodes are for train reporting. 1 - Express passenger train, postal train, newspaper train or breakdown train or snow plough going to clear the line, or light locomotive going to assist disabled train. Officers' special train not requiring to stop in section. When these codes ceased to be used at the end of 1975, train crews were supposed to set the blinds (the numbers are on separate fabric strips like bus blinds) to four 0's. Most did but occasionally you'll see more adventurous versions with the loco number or even class being shown instead. Later, the blinds were replaced by a pair of white dots or the headcode box was plated over with metal. 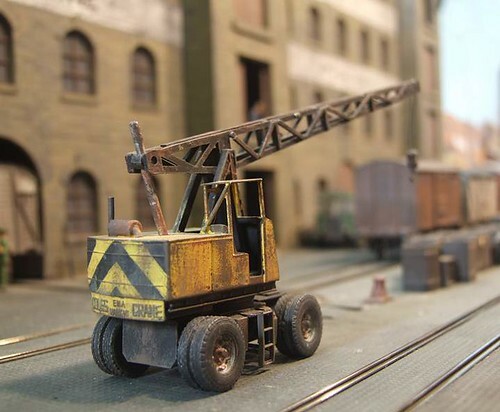 My mobile crane collection owes nearly everything to Langley Models. At the back we have the Ransoms Rapier 6ton Mobile Crane from Langley, code RW14. Not a cheap kit but for a complicated prototype, well worth the money. The build of this model is described in February 2011s issue of Hornby Magazine - basically, it's complicated but perfectly do-able. The result looks the business and as the prototype was so common on the real railway (or maybe BR liked to show them off for the photographers), a welcome addition to the scene. 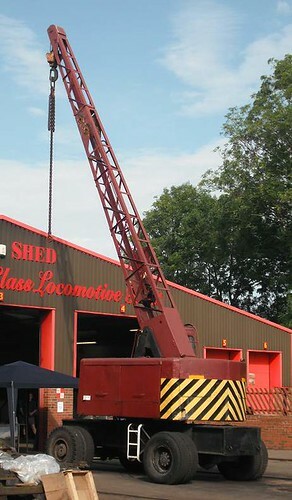 At the front is a Coles crane that has been with the layout since the very beginning. The top half is straight out of the classic Airfix Recovery set. I can't claim any originality for the conversion any more than I can remember what I did with the rest of the bits from the set. Maybe adding the cab was different from the versions people like Michael Andres produced back in the old days, but probably not. Underneath, the crane swivels on a simple plasticard chassis mounted on whitemetal wheels picked up from the Langley pick'n'mix section at an exhibition. I can't make wheels like this and why bother, when you can pick them up for pennies ? Adding a bit of ladder and some fuel-tank like lumps was simple enough. Probably not that accurate but it looks the part to my eyes. One trick for crane builders is to ignore suggestions of using thread for rope - try fine iron wire instead. Much easier to keep straight and hang properly. Two Bedfords by two different methods. 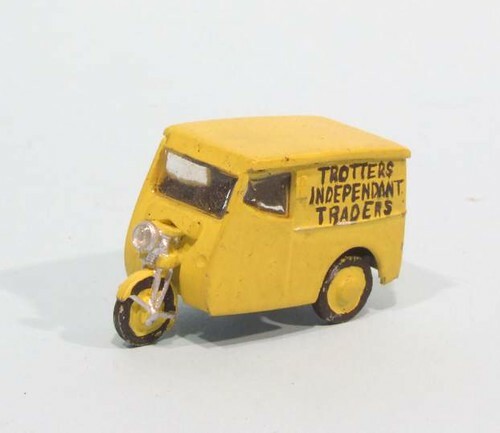 At the back we have a lorry built from a Springside whitemetal kit. I wanted to build what is a relatively expensive kit, since seeing one on a friends model of Scotland Street Yard. Dave's version was a lot better than mine, but I excuse myself by pointing out that it's a pig of a kit to build and I did mine many years ago. That said, if I wanted another, I'd go hunting for a die-cast and repaint it. In front we have a much more traditional way to build such a vehicle, one from the RAF Airfix Emergency Set. For many years, modellers have seen the fire engine from this pack as the route to a Bedford. You'd use the cab (with the machine gun hole in the roof filled in), wheels and some of the chassis. The rest would be built from plastic sheet and strip - not rocket science but more work than modern modellers are accustomed too. Incidentally, the fuel tank from the fire engine took up residence on the layout as an oil tank so the bits weren't wasted. Look at this photo from the the early days of Star Wars movies. All the spacecraft as real models - not CGI rubbish ! An oddball entry in my reviews of model shops - The Midland Air Museum on the outskirts of Coventry isn't only a model shop, it just has a very good one in the entrance. Finding the "shop" isn't difficult - head for Coventry airport and it's beside the Vulcan bomber. Inside, you can buy a ticket to look around the exhibits but you can just stay in the shop which is very well stocked with plastic kits of, unsurprisingly, aircraft plus some tanks and a few boats. 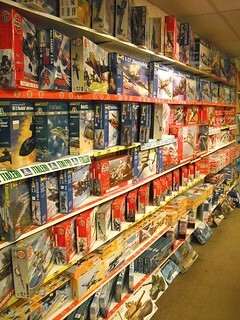 The range is impressive with Airfix, Revell and a couple of more obscure makes on the shelves. Opposite the kits is a Revell paint rack with a few other modelling bits and bobs. At one end of the room are die-cast planes'n'stuff including the souvenir goodies that every museum should have. At the other end is a bookshop with new and second hand publications as well as a decent stock of old (read: current for the propeller powered planes you are probably building) prototype magazines. 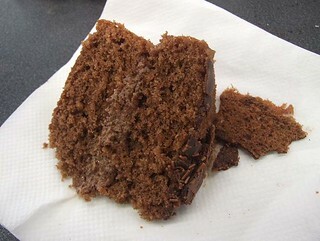 Beyond this, a cafe with home made cakes and yummy things. If you do decide to pay a visit, the displays are excellent. As well as the full sized exhibits, masses of models are used to illustrate many of the educational aspects on show. If you are giving the history of a particular plane, why not use models rather than pictures ? It's not just plastic kit based planes either, there are quite a few mock-ups of proposed aircraft and wind tunnel models. Everyone's favourite on the layout - Grandpa Trotters van. 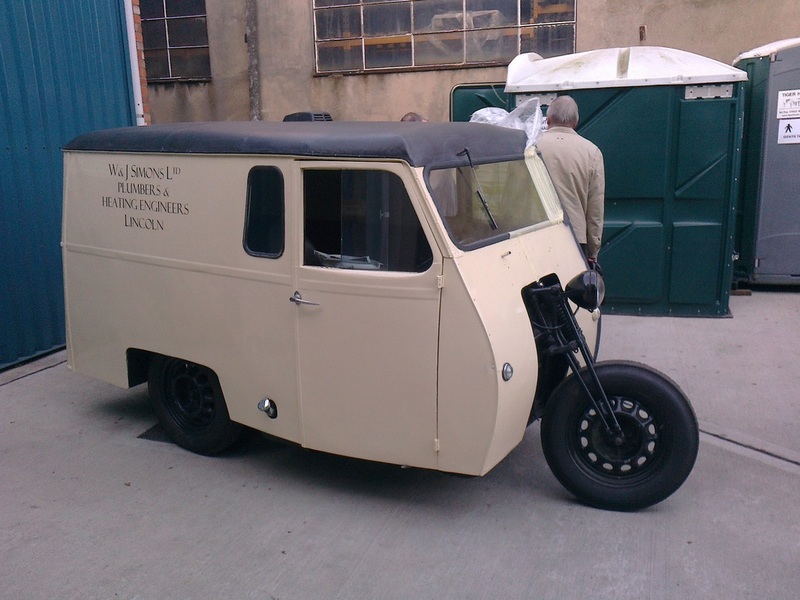 If there is one vehicle that attracts attention, it's this little Reliant van. Everyone wants to know about it and yet it's the simplest model on show. If you want something similar, buy the Dart Casting Kit, stick the bits together with superglue and paint it yellow. Lettering is down to careful work with a paint brush, nowadays I'd use a fine pen or computer generated lettering although maybe the Trotters (from the BBC TV series "Only Fools and Horses" for the younger reader) would have skimped and painted it themselves anyway. There are still a few of these on the road as classic vehicles. A three-wheeler can be driven on a motorcycle licence. I know a member of the Salvation Army who once gave me a lift in his Rialto and explained that if a policeman asked, the correct procedure for revering was to switch the engine off as part of the gear changing and then back on once in gear. Apparently, those on a motorbike licence mustn't just shove the stick across ! This explains the popularity of the vehicles - very, very few people had cars but plenty had bikes, often with sidecars. This was the best of both worlds with the added advantages of maneuverability and low running costs. I'm surprised they aren't more popular today. Of course, this hold no sway with the sort of modeller who thinks you can research a 1950's layout by looking out of the window today. Sadly, quite a lot of the people who don't get it are of an age where they simply need to remember their youth ! A couple of days ago, I showed lorries constructed from Cooper Craft plastic kits. Well, once you start then the kit is very adaptable. There used to be an advert in the back of Railway Modeller which showed the side and front views of a Foden truck. While this was to advertise a kit, I reckoned that it wouldn't be too difficult to modify the ARC plastic kit to something passable. All I did was cut the cab fronts ahead of the door and bring them in a bit. The cab front was then narrowed. Finally the radiator lot its central pillar. With hindsight, the radiator should have been narrowed a lot more but apart from that, it's not a bad effort. Behind the drivers compartment, the body has been halved in length by chopping away the rear side doors. The chassis also needed shortening. For variety, and because it saved some modelling, the lumpy load is covered with a toilet paper tarpaulin. The forklift is an easier, if more expensive model. 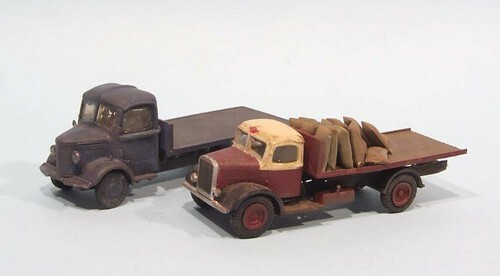 Simply a kit from Viking for a nearly suitable truck that has been shortened because early examples tended to be a lot stubbier than later models. The safety cage wasn't required either because people didn't think about that sort of thing in the old days. Or at least employer didn't, The guys in the hot seat might have been more concerned ! Kevin Robertson has published several excellent volumes on the infamous Leader class of locomotives that were to intended to be the biggest step forward in steam locomitve design since Stephenson. If you want to know about this engine, he IS the man. 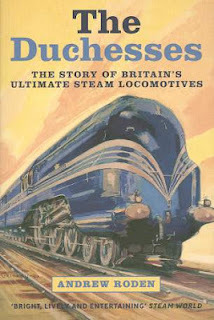 I have read and enjoyed these so when I spotted that he'd also written what appeared to be a biography on Oliver Bulleid, the engines designer, I couldn't resist. Nicely published in A4 hardback of excellent paper, this is a quality publication. If you buy it for the photographs alone you won't be disappointed. If you won the Leader books, then I suspect you might find some of the images used before but that is to be expected. There is more than Leader here so don't let that put you off. The book isn't strictly a biography, it is more about trying to define the man. Constant reference is made to other works, especially "Bulleid Last Giant of Steam" by Sean Day-Lewis and this caused me a problem. I've not read these and don't have enough interest in the subject to do so. 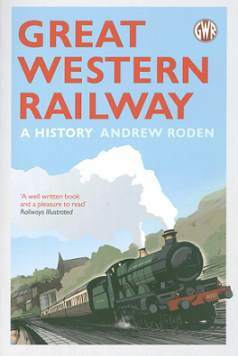 If you are soaked in Southern (and a bit of LNER and Irish) railway history then I think you'll get more out of it than I did as you'll enjoy agreeing with the author (or not) when he disagrees with previous books in the area. Personally, I could have done without this as I'm happy to accept Kevin as an authority on the subject. Indeed, it was the one problem I had with the text. Having said that, whet you get is a very full history. Leader obviously casts a significant shadow but there are the years before and after this beat and they are well documented. Tavern cars and double deck trains appear in both words and (lots of) pictures as does the designers time in Ireland where he developed the Leader concept into a successful turf-burning engine, sadly too late to stop the tide of dieselisation. Pre-Leader we get experiments with the LNER and then early Southern days including the Q1, another of my favorite locos. Bulleid doesn't get off lightly. He is revealed as a man of strong will but with the ability to persuade people even when it would have been better if he himself had been persuaded. Punches aren't pulled which makes for a balanced read. At the end of the book, the author states his position but also lets the reader make his own mind up. 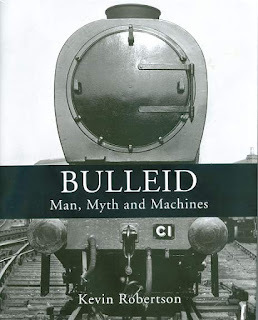 For my part, I have a feeling that had much of the work been carried out 10 years earlier, and had Bulleid been willing to listen to the people who had to make his engines work, then steam on British rail could have looked very different.